Hi everyone, Christine here today. 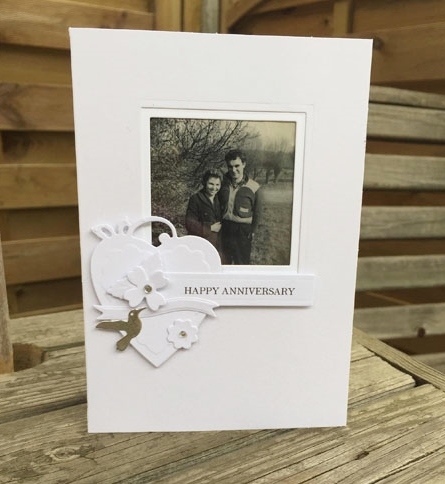 Recently my parents celebrated their wedding anniversary and they both definitely deserved a handmade card. 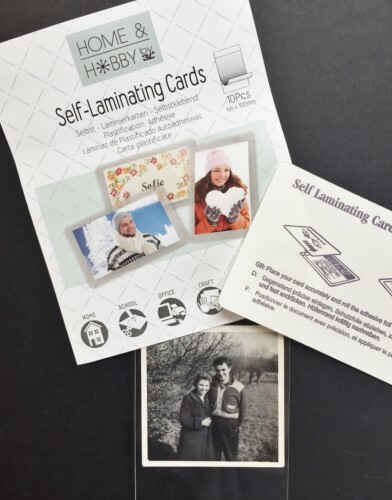 I am featuring the Self-Laminating Pouches – Card Small to give the card an interesting twist. 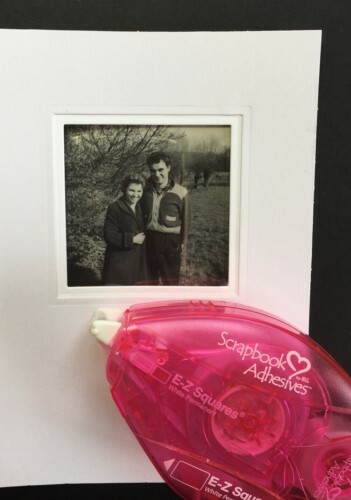 I went through some old photographs and found one when they were in their teens together in the 1950’s. To preserve the photo I decided one of the Self-Laminating Pouches – Card Small would be perfect and also use it as an aperture for my window card. 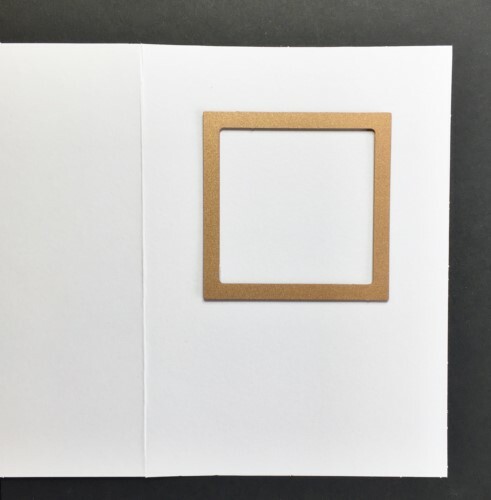 To create the aperture I die cut a square ensuring my Self-Laminating Pouches – Card Small would fit neatly behind. 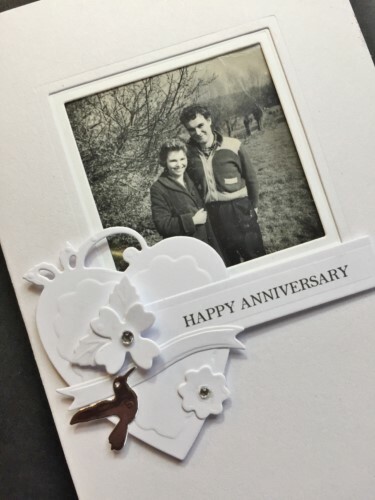 It is possible to cut an additional piece of card to create a double mount. To affix the laminating pouch I selected E-Z Squares Refillable Dispenser. NOTE: dispenser is refillable to match ANY of the other E-Z adhesive refills – they are all interchangeable. LOVE! To conceal the reverse of the laminating pouch inside your card affix into place another piece of card. 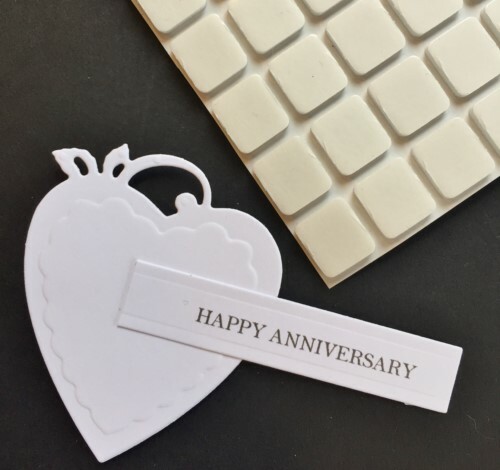 I gathered together some additional die cuts to decorate the card front and affixed the heart with 3D Foam Squares, White – Regular. I kept the color scheme white with just a touch of silver. Thank you for joining me today and please remember to check out the brilliant products listed below with their links. This entry was posted in 3D Foam Squares, Adhesives, Cards, Crafts & Tutorials, E-Z Runner® Dispensers, HomeHobby by 3L, Permanent Adhesive, Self-Laminating Cards, Tutorial, Wear your Adhesive on the Outside and tagged 3D Foam Squares Regular White, Anniversary, Card, Card Making, Christine Emberson, E-Z Squares Refillable, HomeHobby by 3L, Self-Laminating Pouch Small, Spellbinders Paper Arts, Tutorial, Wear Your Adhesive on the Outside. Bookmark the permalink. One Response to "Aperture Card with Self Laminating Pouches"